20p Roulette is a traditional style roulette game featuring on William Hill, Betfred and independent bookmakers betting terminals. With a minimum chip value of 20p and a minimum bet per spin of £1, 20p Roulette is one of the most popular roulette games on the FOBTs. 20p Roulette is a random, 37 number roulette game with a minimum betting time of 20 seconds per spin, a maximum bet of £100 per spin and a maximum possible return of £500 per bet. The bets can be laid out on any number, corner, street and outside bet making 20p Roulette very similar to online versions of traditional roulette, and a very close comparison to Penny Roulette. Once you have laid your bets and pressed spin, the roulette wheel will rotate with the ball launching directly opposite to its final landing position. Once the animation has come to an end, any winning bets will be paid at the roulette standard odds of 36/1, you can then repeat the bet or start anew with some fresh numbers. 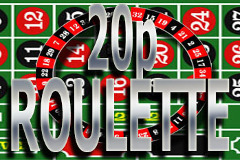 20p Roulette is a random roulette game, and as such can go long periods without landing in your favourite numbers, and likewise, can also hit many of your lucky numbers in close proximity. The speed at which you can place your bets can often result in situations that would be less likely in land based casinos, such as the speed at which you can win and lose money, as well as the ease at which you can bet. It is with this in mind that although there are no actual tips for 20p Roulette, it is advisable to pace your betting to avoid playing at £300 per minute. 20p Roulette has a cousin in Bonus Roulette, with both games often sitting side by side on the betting terminals menu screen. Bonus Roulette is identical to 20p Roulette in every way, with the same allowable betting patterns and neighbour betting. The bonus aspect of Bonus Roulette comes from the option after each winning spin to gamble your money with either a x3, x2, x1, half and lose. The odds of winning are far less than betting on the roulette wheel, so statistically you will be better off avoiding this 'bonus'. The fact that 20p Roulette has been with us for so long is testament to the games popularity, and aside from visiting a casino or playing online, this roulette game is as close to the real thing available on High Street Fixed Odds Betting Terminals. We do stil recommend playing European Roulette ahead of it from a better odds perspective.